Optical frequency combs are laser sources whose spectrum comprises of a sequence of discrete, equally-spaced frequency lines that can be used for exact measurements. In the last twenty years, they have become a huge tool for applications such as spectroscopy, precise distance measurement, and telecommunications. The majority of the commercially available optical frequency comb sources based on mode-lock lasers are large and costly, restricting their potential for use in portable applications and large volumes. Although chip-scale versions of optical frequency combs using microresonators were first seen in 2007, a completely integrated form has been obstructed by high material losses and intricate excitation mechanisms. Study teams led by Tobias J. Kippenberg at EPFL and Michael L. Gorodetsky at the Russian Quantum Center have presently constructed an integrated soliton microcomb working at a repetition rate of 88 GHz using a chip-scale indium phosphide laser diode and the silicon microresonator. At just 1 cm3 in size, the device is the smallest of its type till date. 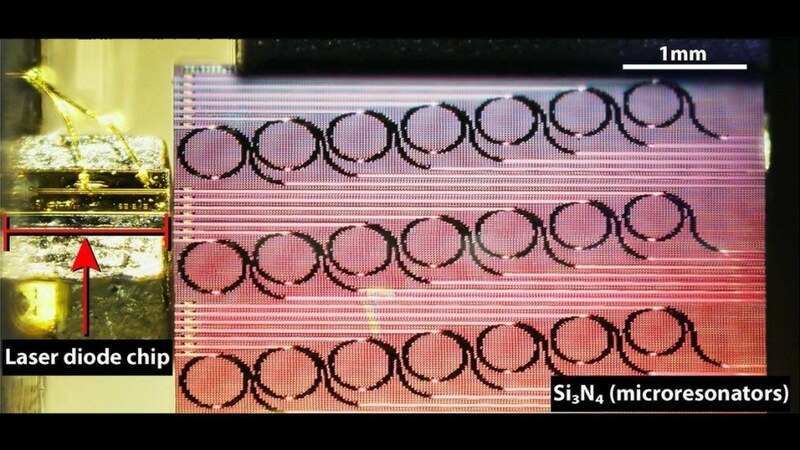 The silicon nitride microresonator is fabricated using a patented photonic Damascene reflow process that yields unparalleled low losses in integrated photonics. These ultra-low loss waveguides bridge the gap between the chip-based laser diode and the power levels needed to stimulate the dissipative Kerr soliton states, which underlie the generation of optical frequency combs. The technique uses commercially available chip-based indium phosphide lasers instead of conventional bulk laser modules. In the stated research, a small portion of the laser light is reflected back to the laser because of intrinsic scattering from the microresonator. This direct feedback helps to both stabilize the laser and produce the soliton comb. This demonstrates that both laser and resonator can be combined on a single chip offering an exceptional improvement over former technology. There is a significant interest in optical frequency comb sources that are electrically driven and can be fully photonically integrated to meet the demands of next-generation applications, especially LIDAR and information processing in data-centers. This not only represents a technological advancement in the field of dissipative Kerr solitons, but also provides an insight into their nonlinear dynamics, along with fast feedback from the cavity. The entire system can fit in a volume of less than 1 cm3 and can be regulated electrically. The compactness, easy tuning method, low cost, and low repetition rate operation make this microcomb system interesting for mass-manufacturable applications. Its main advantage is fast optical feedback, which eliminates the need for active electronic or any other on-chip tuning mechanism. Arslan Sajid, PhD Student and Study’s Lead Author, EPFL. The researchers currently aim to exhibit an integrated spectrometer and multi-wavelength source and to enhance the fabrication process and the integration technique further to drive the microcomb source at a microwave repetition rate.